Once again on the move…. This time Vietnam. (One of these days I’ll myself choose where to go.) Right now Vietnam is increasingly on the radar for travellers. There’s already some tourist infrastructure, but the real draw is the beaches, food, and the very low cost of everything. Vietnam is one of those places that is just coming into it’s own and, in certain areas, exploring what kind of tourist destination it wants to be. In regards to looking for spas, however, the prices are beginning to look more and more like western prices. But there are still some options for budget travellers. So off my colleague and I went to check it out. I suppose we could have ordered the soak. It would have been cool to use these tubs, but alas, they stayed as just something pretty to look at while receiving our scrub. Though everything seemed quite professional, one issue with Vietnamese customer service, that revealed itself to be a recurring one, is that it always feels a bit rushed. It was here that I felt that for the first time. But nonetheless, we enjoyed the short but sweet steam and scrub. The lulur scrub was nothing compared to those in Indonesia and it left us with a bit of an orange residue that got on our clothes and stayed in our toes. 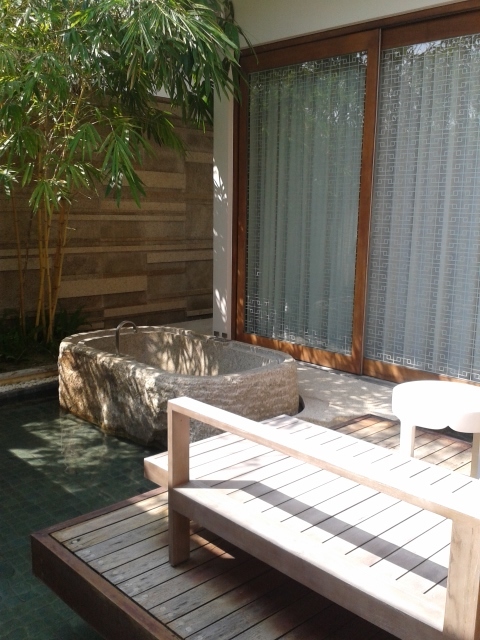 But when dealing with non-bathing spas, where you have to order a service, a scrub beats a massage every time. I believe that we paid about $40 for the 20-minute steam and about 40-minute scrub here, so definitely cheaper than in Canada but for Vietnam this was quite expensive. 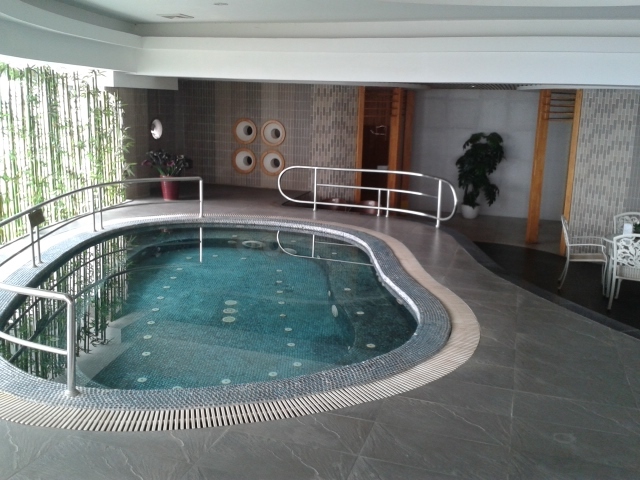 I mean, it was a warm swimming pool and surely the water had minerals in it – but hardly even worth mentioning in the spa blog except to ask: did I miss something? Though I found these hot springs a bit disappointing, one can always looks forward to vacation! It made a lot of sense for us to head to Danang in central Vietnam. There was a lot to do there and other cities were close by. Nha Trang was just a little too far from Hanoi, but it would definitely be the next spa destination to hit had I more time. Nha Trang may have been that something unique I’ve been looking for. 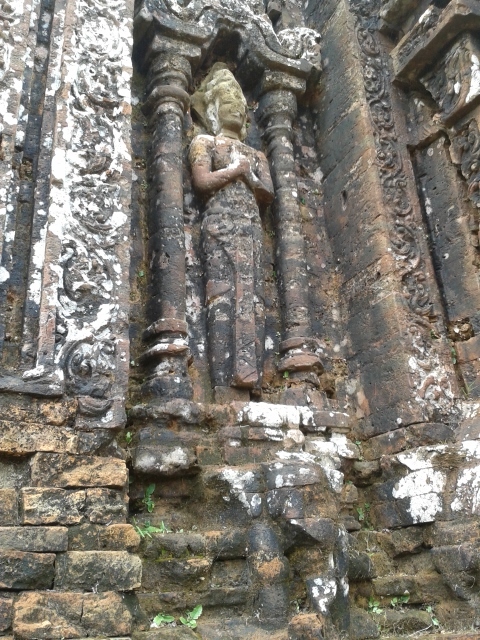 But Danang did not disappoint. 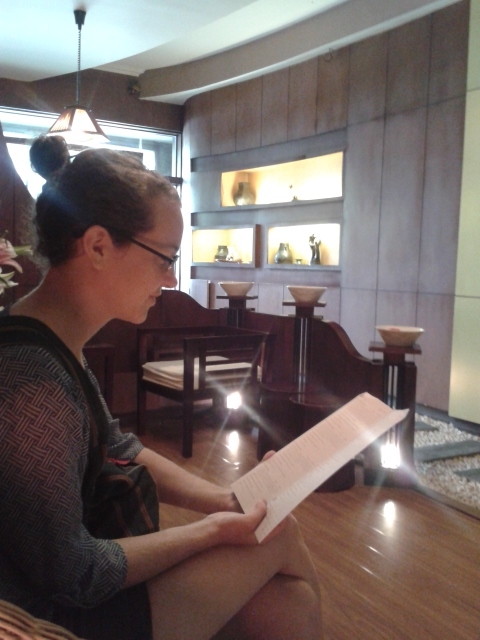 Doing a quick search for spas in Danang the Hyatt quickly rose to the top of the list. And it was worth it. We ended up doing the day pass for the fitness centre on our first day (where the main bathing elements were), then sat on it’s lovely beach front with a huge explore pool, and then went back another day for a scrub. What can I say? 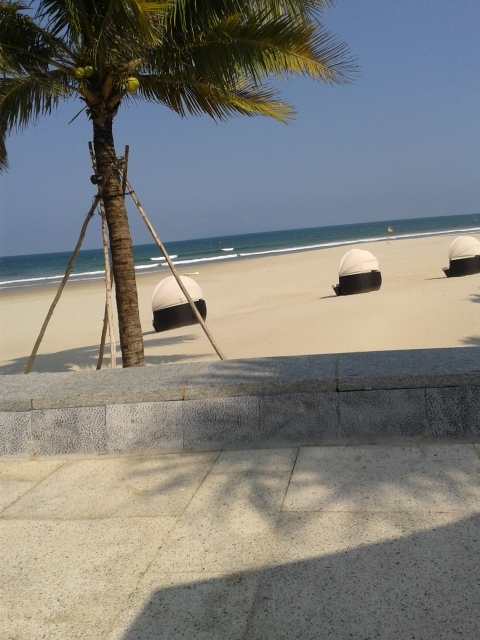 Life was good in Danang. Vie Spa at the Hyatt Regency is beautifully designed and landscaped. If a spa is meant to make you feel like royalty, then this one definitely succeeds. It’s sleek and clean design with sharp lines is something that I began to realize is quite characteristic of Vietnamese spas. 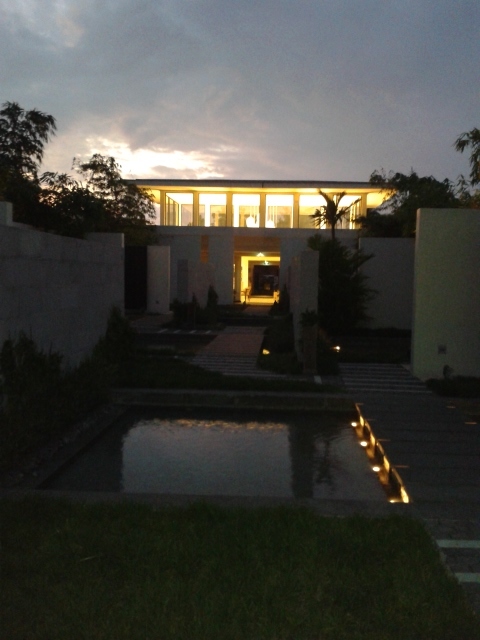 Through the lobby you come back out side to the beautiful walkway shown above. Inside the women’s change room of the fitness centre you will find a steam room, a dry sauna, a cold dunk pool, and what I believe was a whirlpool, but it was not functioning at the time. We spent a lot of time in this area, getting hot, dunking it off, and lounging by the pool. It was soooo nice to have the place to ourselves and just sweat and sleep! Good natural lighting. 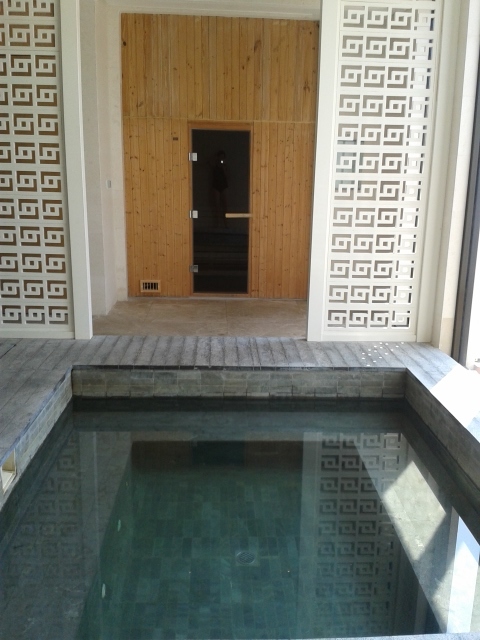 Both the sauna and the steam room got quite warm (eventually), and the outdoor pool was a nice add-on. So we spent a lot of time there before we went down to the beach to hang out. Technically you are suppose to pay for a day pass for the beach access as well, but we just walked down in our robes and figured we were good. We had a great lunch. But at these big resorts remember, it’s not cheap. But it is beautiful! 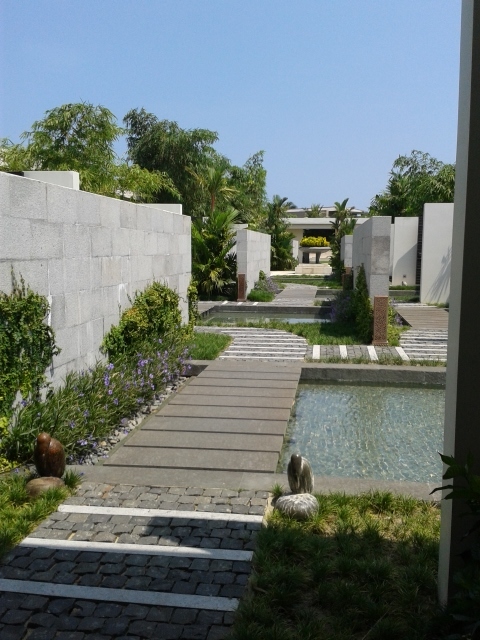 I lucked out and we had some extra time before we had to leave Danang and so what better to do than catch a quick spa. We went back to book appointments at Vie Spa. It was then that we realized that there was a difference between the fitness centre and the spa. But we still requested to be able to sweat a little bit before we went in for … a scrub, of course. 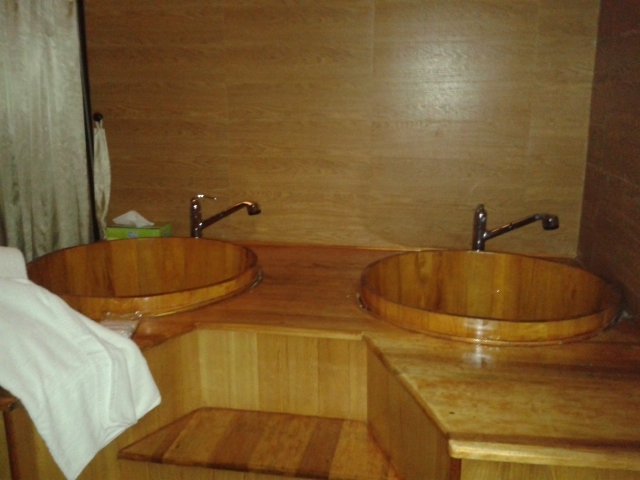 The treatment rooms at Vie Spa are really quite lovely and each room actually has it’s own steam shower. The sea salt scrub that we had was pretty good. Once again I need to reinforce that for the bathing spa enthusiasts, you should go for the scrub option over just a massage. Just one note though, sometimes sea salt can be pretty abrasive. 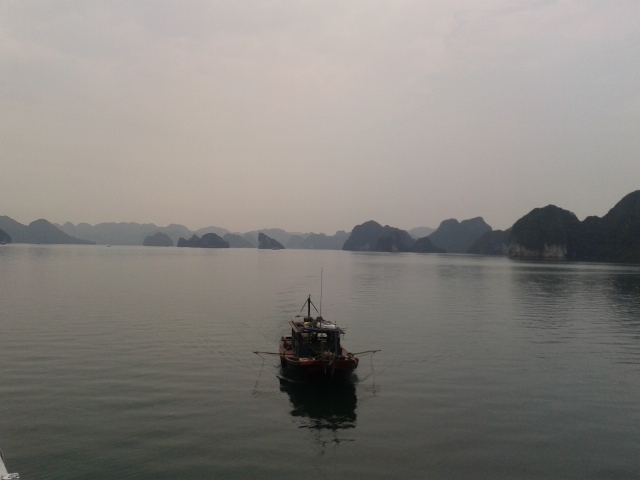 But it felt awesome and that feeling lasted well through our flight back to Hanoi. As lovely at nighttime as it is in the day! Also if you’ve been travelling for a bit it’s nice to check out their bakery café. 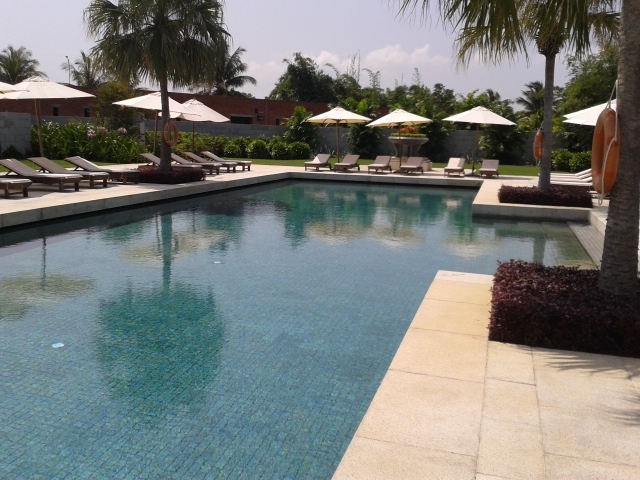 While in Danang we were also able to check out Pullman Resort. What started as “let’s just sneak onto the property to use their beach” led to, “let’s just stay in the pool” led to, “let’s warm up in the sauna.” So honestly, it was super innocent. It’s not my fault if people just want to let me in for free as if I were a hotel guest! Actually I should really start that whole process with the photo above. 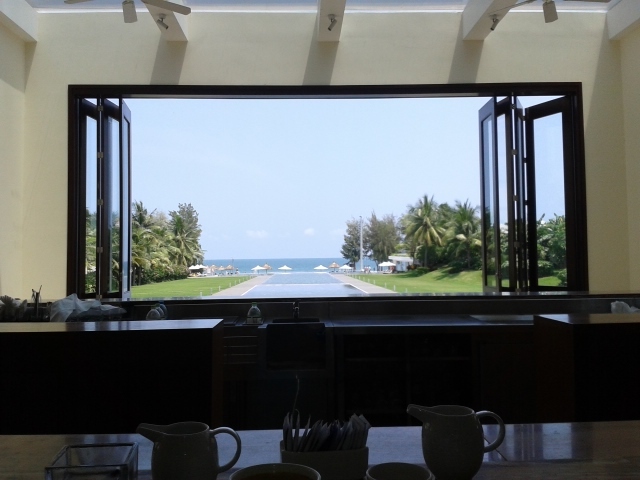 What really lured us in initially, was giving up on renting bikes and having a coffee with this view. All facilities were decent, though a bit on the cool side. The sauna took some coaxing. But all in all a great place to step into off the beach and warm up a bit. The down side? No natural lighting. The upside? Right off the beach and a nice condensed yet spacious set up. 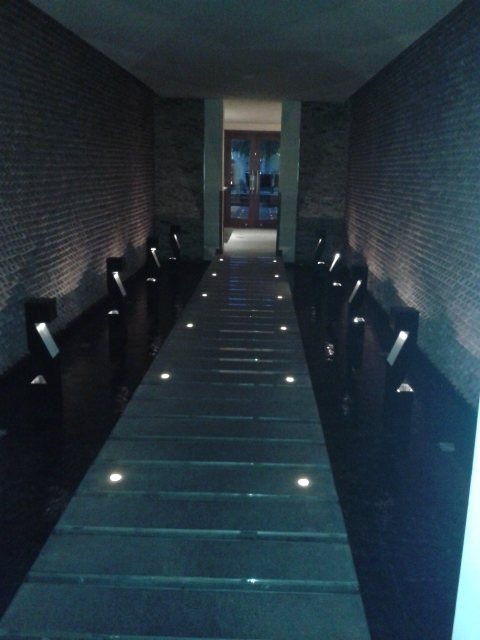 I should really end this entry with the spa that I got know the best, which was in the city where I was living. In Hoa Binh there is modern-style complex which contains a department store, grocery store, karaoke, ‘The Fashion Café” and, of course, a spa. At the top of AP Plaza there is a Spa – hmm – why can’t I even remember the name? Well, really, if you really find yourself in Hoa Binh all you really need to know is just AP Plaza. 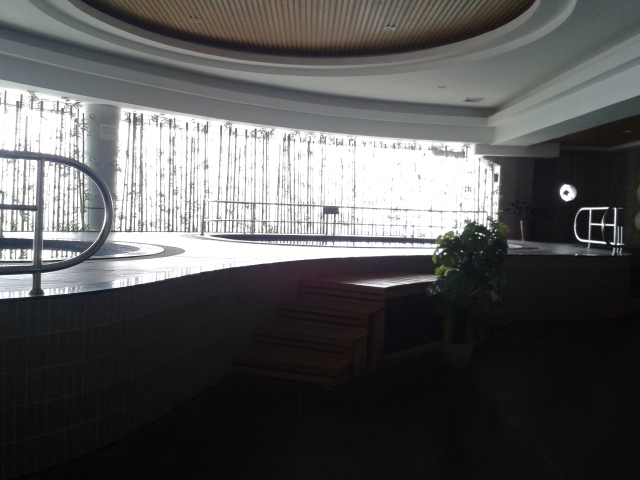 It was a good spa considering that the city wasn’t that big really. The dry sauna eventually got hot, the steam room was very hot, and the two pools at the top of this building were enough to get a much-needed sweat. Considering that I spent 3 months in a small village, I was grateful of what I had. It was not the cleanest I admit. And the customer service again was super rushed. They would only set the sauna heat for a certain time and then it would shut off. For everything that you wanted to have turned on, you had to call an attendant to start or restart the heat or jets etc. But like I said, I was grateful. But who really needs that much time to sweat or soak when you’re waiting for a massage (wink wink.) 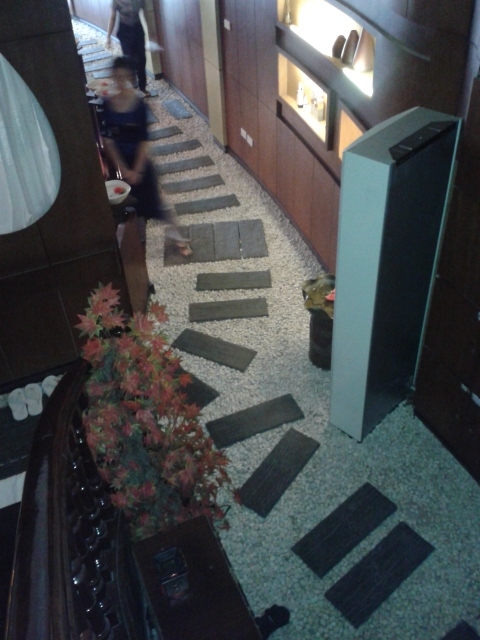 It was here that I began to learn a bit more of the culture for men in Vietnamese spas. It would seem that spas are often used by business men to relax, unwind, smooze, and release their pent up sexual energies from the hard day? Yes… I mean I don’t entirely know how this all works, but I do know Vietnamese men who have used the spa services for happy endings and I (fingers crossed) trust that my husband did not receive one after his massage. However that did not stop his having to tip her. All in all I wouldn’t necessarily consider Vietnam a powerhouse when it comes to spa culture. But if you’re the kind of person who needs a massage or a pedicure every week or everyday, you are better off in Vietnam. The prices are great. 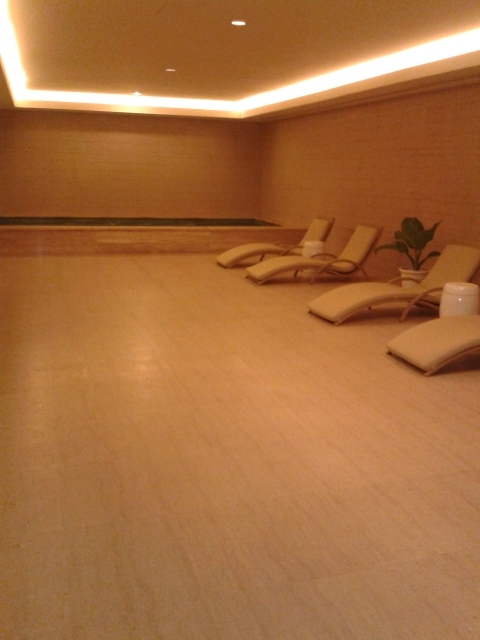 And every spa seems to have a steam or sauna. So I was not at a loss to get my sweat on. But the dedicated bathing enthusiast might be more pleased opting for the beautiful beaches and a good old fashion sunbathe.